Safeguarding key heritage water resources for KwaZulu-Natal is a privilege for us at Msinsi Resorts and Game Reserves. And with fishing a popular activity at all our dams, one of our many interesting duties is looking after our stocks of bass, carp, tilapia, barbel (catfish) and scalies (yellowfish) for SA’s fishing enthusiasts. Whether you come for a quiet contemplative fishing session midweek or participate in one of the big, nationally acclaimed competitions that we host, you’re always welcome to add to our stew of fishing legends. Albert Falls Dam and Game Reserve: Albert Falls Dam is more than the fourth biggest dam in KZN by volume with nearly 300m cubic metres of water - it’s also recognised as SA’s premier bass-fishing dam and home to the Albert Falls Bass Classic towards the end of August. The record for the largest bass caught here is currently 5.642kg. Albert Falls Dam also holds a world record for the largest bass catch in one day, six bass totalling 24kg. We believe part of the secret is closing the dam for a month after the Bass Classic to allow the fish to spawn. Carp are also plentiful, with specimens of 10kg being caught. With the waters of Alberts Falls Dam stretching across about 2500ha, there’s plenty of room for everyone to fish here in the heart of the KZN midlands at about 650m above sea-level – and you can even fish here overnight. Inanda Dam and Resort: So far Inanda Dam’s official bass record is 5.23kg - but unofficially, it’s said that a bass of 7kg has been caught. Whatever your luck, it’s pure pleasure choosing one of the many bays along Inanda Dam’s extensive shoreline and settling in to fish here in the warm coastal belt at any time of the year. Large specimens of tilapia (blue and red-chest), barbel (catfish) and scalies (yellowfish) are often spotted in spring and autumn - some of the intrepid even try the challenge of catching them on a fly. Nagle Dam and Game Reserve: Well stocked with cub, bass, scalies (yellowfish), tilapia and barbel (catfish), Nagle Dam combines great fishing with the inspiring mountain scenery of the Valley of a Thousand Hills. We allow use of an electric “sneaker” motor while fishing. Hazelmere Dam and Resort: You’ll find barbel (catfish), carp and bass at this relaxing dam within easy reach of both Durban and the KZN north coast. Consider staying over at our Forest Lodge, perfectly sited for a great fishing experience. Bon Accorde Resort: Enjoy great views of the tantalising waters of Albert Falls Dam from your chalet window - and share the fun in some of the best fishing for bass and carp in South Africa! 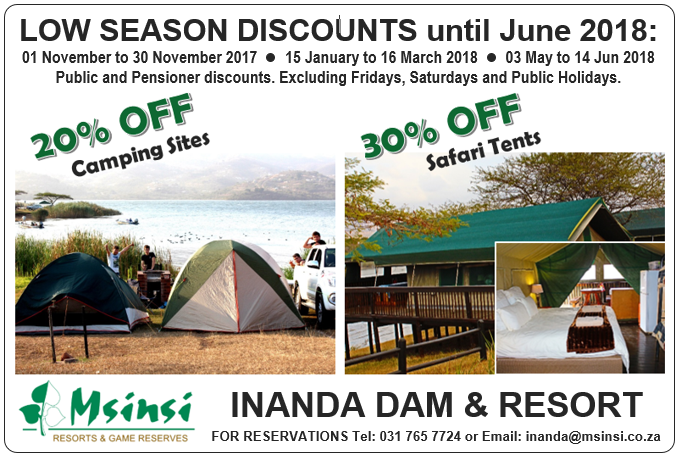 You’ll need fishing permits and boat registration at all Msinsi Resorts and Game Reserves. These are available at the reserve gates or at Visitor Reception. They are renewable annually. Inanda Dam is nicknamed the ‘Dragon Dam’ – those in the know claim its bass are so big that a new SA record could be set here.